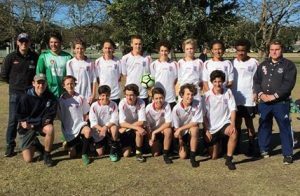 NEWCASTLE High School has qualified for their first Bill Turner Cup (Boys) Finals Series with a hard fought 1-0 win over a determined Byron Bay High at York Street Ground (Coffs Harbour) on Friday (August 17). 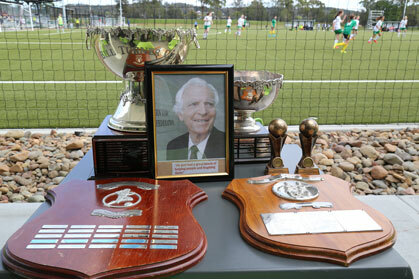 The Bill Turner Cup is a High School competition for students 15-years-and-under in a knock- out format which commenced with 450 teams from Cairns to Melbourne, all regions of NSW, and the ACT in April. The top four schools from the Cup’s 450 boys and Trophy’s 400 girls schools, will contest the National Finals Series at the Lake Macquarie Regional Football Facility at Speers Point next month. ARCHIE GOODWIN netted the winner for Newcastle in the 13th minute to send his team the furtherest in the competition since the first Bill Turner Cup was contested in 1979. Belmont High beat Whitebridge High 1-0 at Crystal Palace (Wallsend) to be crowned the inaugural Champions. Byron Bay pressed Newcastle at every opportunity but Newcastle’s defence stood tall while the woodwork came in to play on two occasions. Two minutes before Goodwin scored for Newcastle, Byron’s go-to-man KAHI ADDIS rattled the Newcastle bar with a stinging left foot half volley. “At the end of the day not the result we were after,” Byron Bay coach HARLEY SCHMIDT said. The post denied Newcastle a second in the 49th minute with Riley Parker’s shot, from just inside the penalty box, bouncing back into play. “Really happy with the win, the boys stuck to their game,” Newcastle High captain PAT BOND said. Newcastle will play either Mamre Anglican School or Westfields Sports High in their semi final on Tuesday September 4 at the Lake Macquarie Regional Football Facility at Speers Point. “Really looking forward to it, two games (in two days),” Bond said. “Third place play-off if we lose (the semi final) and the final if we win, hope to win I guess. Mamre and Westfields play their quarter final on Thursday (August 23) at Club Marconi.